Home Planetarium Survey, 2008. 7.5 x 7.5 in. Digital-offset printed, saddlestitch bound, 16 pages, edition of 100. Toy planetariums are essentially covered lamps which shine a replica of the night sky on the ceilings and walls; there are many different brands and models worldwide. 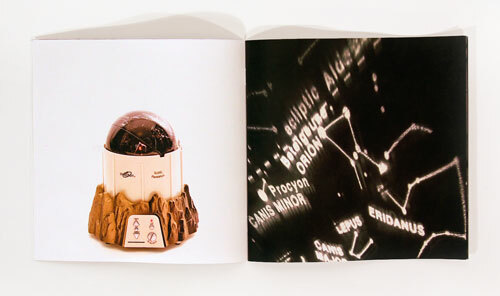 Home Planetarium Survey displays seven toy planetariums and photograms of the constellation Orion as projected by the planetariums; the photogram constellation image was captured by exposing photosensitive paper directly with the light of the planetarium. Each depiction of Orion is identifiable but quite different from each of the others—reminiscent of the common legibility of alphabet letters between different handwritings or typefaces. 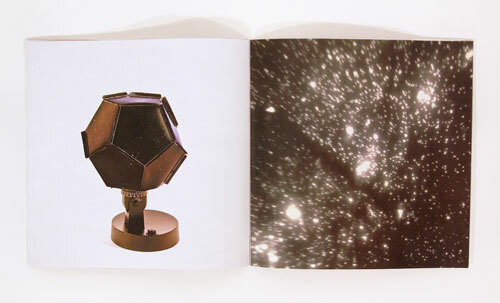 This book was shortlisted in 2011 for ‘Artist Book of the Moment’ by the Art Gallery of York University in Toronto. Home Planetarium Survey: $25 includes shipping regular mail within the USA/Canada. For shipping outside the USA/Canada please email for an estimate before purchase [ hn (at) heidineilson (dot) com ].